Joins in SQL server are used to query (retrieve) data from 2 or more related tables. 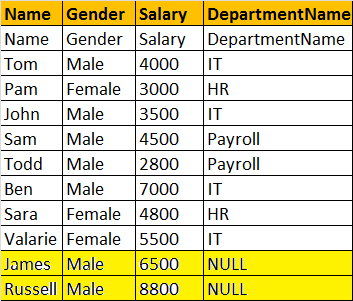 In general tables are related to each other using foreign key constraints. Please watch Parts 3 and 5 in this video series, before continuing with this video. 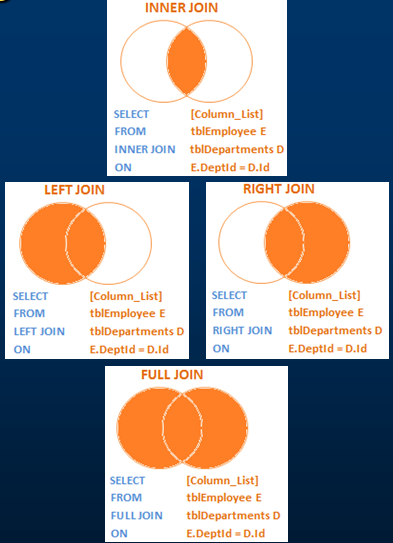 In SQL server, there are different types of JOINS. Now let's understand all the JOIN types, with examples and the differences between them. CROSS JOIN, produces the cartesian product of the 2 tables involved in the join. For example, in the Employees table we have 10 rows and in the Departments table we have 4 rows. So, a cross join between these 2 tables produces 40 rows. Cross Join shouldn't have ON clause. 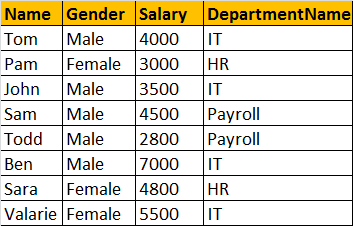 Write a query, to retrieve Name, Gender, Salary and DepartmentName from Employees and Departments table. 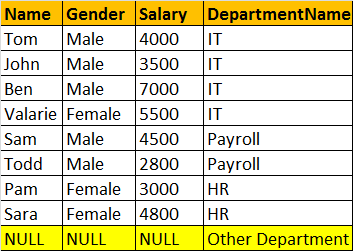 The output of the query should be as shown below. Note: JOIN or INNER JOIN means the same. It's always better to use INNER JOIN, as this explicitly specifies your intention. If you look at the output, we got only 8 rows, but in the Employees table, we have 10 rows. We didn't get JAMES and RUSSELL records. 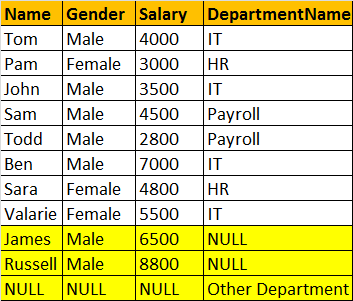 This is because the DEPARTMENTID, in Employees table is NULL for these two employees and doesn't match with ID column in Departments table. So, in summary, INNER JOIN, returns only the matching rows between both the tables. Non matching rows are eliminated. Now, let's say, I want all the rows from the Employees table, including JAMES and RUSSELL records. I want the output, as shown below. LEFT JOIN, returns all the matching rows + non matching rows from the left table. In reality, INNER JOIN and LEFT JOIN are extensively used. I want, all the rows from the right table. The query output should be, as shown below. 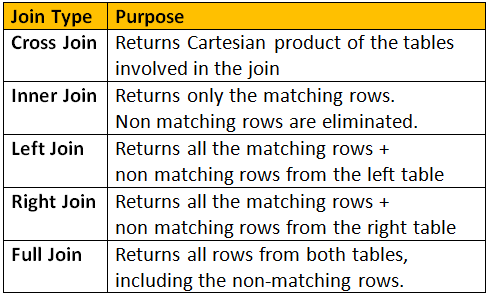 RIGHT JOIN, returns all the matching rows + non matching rows from the right table. I want all the rows from both the tables involved in the join. The query output should be, as shown below. 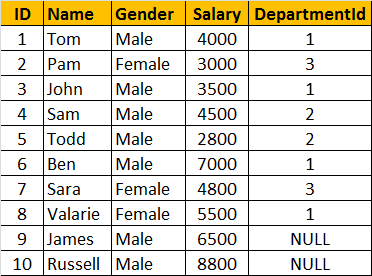 FULL JOIN, returns all rows from both the left and right tables, including the non matching rows. I have a doubt.... In which case we use cross join?? All available car options can be achieved by cross join.. This may not be the best example, but it just came to my mind on fly just wanted to throw it out there to check if it helps. @Vikul, To add a one more point. I read somewhere, If you want to have a huge test data . you can use cross join.